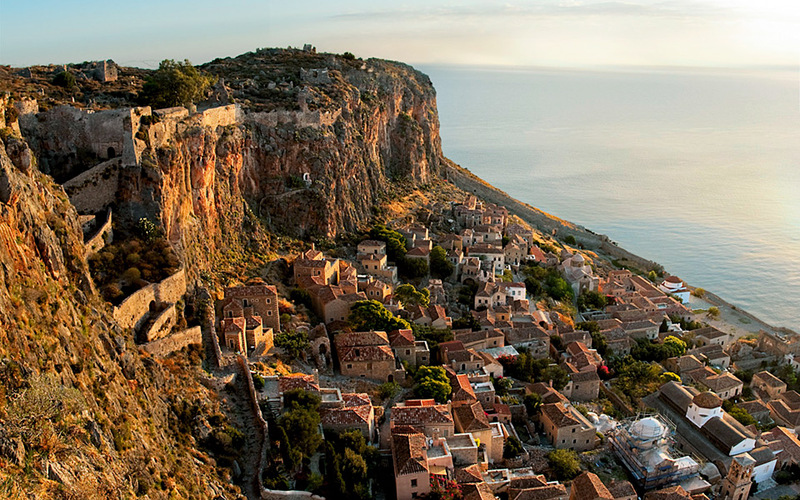 Panoramic view of the Upper Town and Lower Town of Monemvasia. Mystras and Monemvasia, the great Byzantine castles of the Peloponnese, remain alive and convey to visitors all the story of the past. Old stone streets, noble mansions hundreds of years old, Byzantine churches, works of art: In the Medieval city-strongholds of Laconia, Mystras and Monemvasia, time seems to have stopped centuries ago — two of just a few places where such a description is no cliché. Here, you do not read history, you walk through it, touch it, experience it. It is all around. The two castles of Mystras and Monemvasia represented the core of the illustrious Despotate of Morea, the Byzantine Empire’s semi-autonomous province in the Peloponnese. The rocky, naturally-defensible islet of Monemvasia served as the initial seat of the region’s renewed Byzantine administration until 1262, when this role was transferred to Mystras — whose own impressive fortifications had first been built by the Franks some 13 years earlier. As militarily strategic locations, both castles were successively claimed or reclaimed by the Franks, Byzantines, Venetians and Turks, resulting in their changing hands several times during their history. Mystras’ authority was strengthened in 1349 when it became the capital of the despotate — essentially the entire Peloponnese. Although the Byzantine Empire was already beginning to collapse from external enemies and internal intrigue, Mystras was reaching its floruit, becoming one of the most important economic and cultural centers of Byzantium and offering the hope of rebirth to the rest of the empire. In the end, however, Mystras could only manage to prolong the empire’s life a little longer, to be its last “glimmer” and final stronghold. Today, as visitors stand facing the Hill of Myzythras, on which Mystras was built, one immediately grasps the significance of the place. Crowned with a mighty citadel and walls that descend around its Upper and Lower towns and their many painted churches, Mystras is rightly considered one of Greece’s greatest archaeological sites, worthy of its ranking as a UNESCO World Heritage Monument. The main gate to the Mystras citadel. 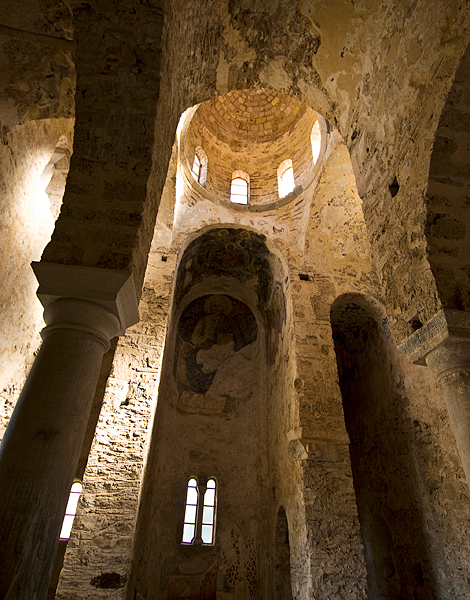 View of the interior of Aghia Sofia, one of the Byzantine churches at Mystras. 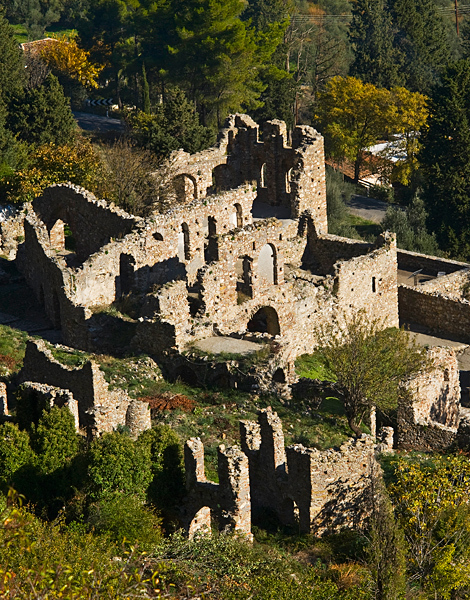 Mystras is also distinctive for being a more-outlying, autonomous tourist destination, in comparison with other archaeological sites that can easily be visited during a single day trip. Consequently, more and more high-quality guesthouses and excellent restaurants are opening up in the surrounding villages of Neos Mystras, Pikoulianika and Parori. Access to the Mystras castle can be gained through either of two gates. Most visitors choose to enter through the Lower Gate that leads directly to the Lower Town; afterward, ascending to the Upper Gate by car, they visit the Upper Town. In the Lower Town are several historic mansions and the site’s most important churches. Inside are precious works of Byzantine art, many of which are kept under lock and key for security reasons. Always open, however, is the Metropolitan church and the interesting museum housed in its courtyard. The museum features artifacts excavated in the town and strives to illuminate the connections and complex influences that once existed between Byzantium and the West. In the Upper Town stands the Church of Aghia Sophia, the famous Palace of the Palaiologoi (under restoration) and the fortress, from which the views of Mt Taygetus and the Evrotas River Valley are incomparable. Of course, visitors who choose to climb from the Lower to the Upper Town and the citadel, strolling on well-marked paths, gain something even more special. The feeling of walking along historic, stone-paved lanes, surrounded by lush vegetation and absolute quiet is itself a monumental experience. 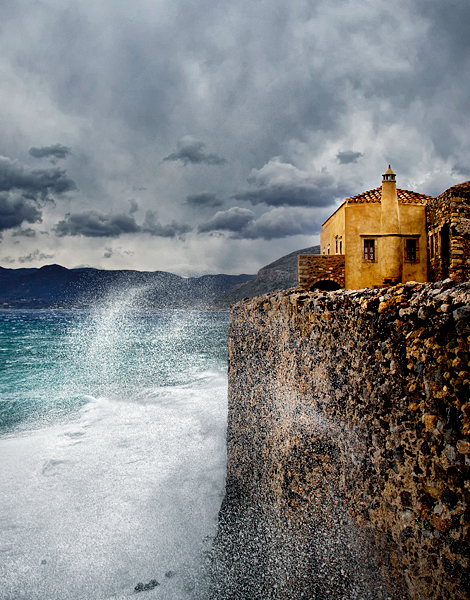 The Stellaki mansion, one of the oldest buildings within the fortress of Monemvasia, right next to the sea wall. Small alleyways, flights of stairs here and there, and a maze of vaulted passages make for a fascinating exploration of the fairy-tale town of Monemvasia. In contrast to the tranquility of Byzantine monuments at Mystras and what the site’s information panels reveal, Monemvasia is — in the words of the great Greek writer Stratis Myrivilis — “a Mystras that lives on.” Monemvasia’s fortress, which has never ceased to be inhabited, is now home to around 10 families, Greek and foreign, who live here permanently; many more are daily commuters, who run guesthouses, tavernas, bars and tourist shops inside the walls. You’ll find all these easily on the main street — named after the celebrated Greek poet Yiannis Ritsos, who came from here and whose house is open to visitors. This was the shopping street where medieval tavernas and cellars once kept prized stocks of Malvazia: Monemvasia’s famous local wine. Strict restoration guidelines have kept the fortified town in excellent condition. Not only does it have a storybook setting, but also a striking position: strangely perched on a giant rock joined to the rest of the Peloponnese by a causeway built in the 2oth century to replace a 6th century stone bridge that had 14 arches and a removable wooden section in the middle. After one crosses over and ascends through the gate, the fairytale begins. 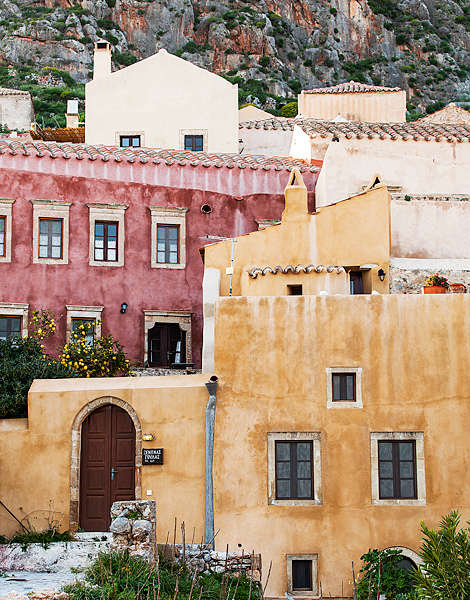 Local legend has it that if you visit Monemvasia with your lover, your relationship is likely to lead to marriage. It is no surprise then that this is such a popular spot for weddings. Wandering through the Lower City on lanes spanned by arches and vaulted structures (“dromikes”), where supplies are still transported by horses; the ascent along the “Voltes” (the fortified street leading to the ruined Upper Town); the Byzantine churches; once-grand houses; Venetian coats-of-arms; and the Ottoman mosque —all take you back in time. In the architecture of these age-old buildings, you can read the entire history of Monemvasia, their stone-work displaying visible traces of all the town’s conquerors. If you wish to live the experience to its fullest, however, it is worth roaming the castle from end to end and spending the night within its walls. Gaze out over the Myrtoan Sea; explore the venerated chapels; rest on the enviable rooftop terraces and in the small town squares; and follow every path —even if it leads nowhere, and even after dark, when lanterns only partly illuminate the mysterious shadows and you feel that from somewhere horses and knights are bound to appear.